Lady Justice is the only cardinal virtue to be memorialized in stone and paint. While her cousins Temperance, Prudence, and Fortitude primarily inhabit the pages of myth, Lady Justice adorns classroom walls, lurks on album covers, and oversees courtrooms. In ancient Egypt, Lady Justice was known as Maat, a philosophical hieroglyph meaning levelness or evenness, that evolved to a personification of the “interrelated order of rightness” (Karenga 2004, 7). The Egyptian Book of the Dead presents Maat as the “goddess of unalterable laws” depicted in female form with her signature feather (Budge  1990, 185). 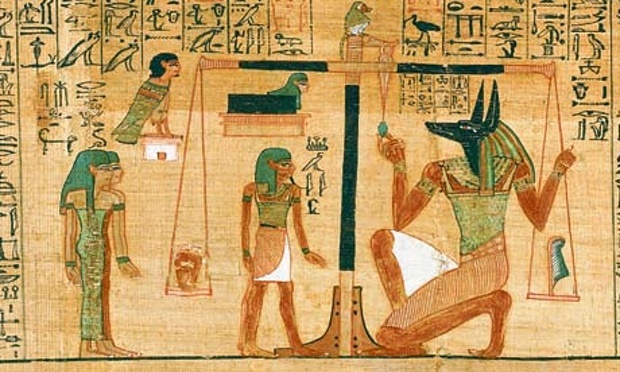 Egyptian funerary art depicts the heart of an individual being weighed against the feather of Maat—a role later delegated to Isis—as the measure of one’s participation in a harmonious order, determining if one passes to the world beyond. In Greece she became the goddess Themis, consort and counselor to Zeus, and the original oracle at Delphi, commanding social assembly, inner balance, and ecological order. “Her very name means an ancient, divine law, a right order established by nature itself for the living together of gods and humans (Donleavy and Shearer 2008, 1). The Romans combined the story of Themis with her daughter Dike together to form Justitia, or righteousness, immortalized today often with blindfold, sword, and scales. Sometimes she is accompanied “by a dog (for fidelity), a snake (for hatred) . . . [and] and ostrich, whose supposed ability to digest anything was seen by the ancients as a useful attribute for the machinery of justice” (Kennedy, online). Among these images of dogs, swords, and feathers, what precisely do the scales balance for us now? Maat and Themis weighed the individual heart and mind against the interrelated and “eternally consistent” harmony of nature (Hall  2003, 130). Popular contemporary definitions place truth in one side and fairness in the other. In today’s judicial system a blindfolded Lady Justice promises impartial decision, free of whims and prejudice, weighing evidence of support or opposition in a given case. But that is merely one form of institutional justice. The scales invite other comparisons between punishment and mercy, between what one offers the world and what is received, and between inherent value and distributed goods. When we call for justice in the streets or in our communities, what exactly are we seeking to balance? Is justice then the still point between conflicting concepts of ideals on one side and messy attempts at embodiment on the other? In this scenario, there seems to be a living vision of “right order” in one scale and a measure of our harmony or dissonance with that order on the other. What are the qualities and characteristics of that order and from where do they derive? Do we inherit our concepts of order from nature? From divine law? From secular values? Is this order poetically eternal or literally stagnant? Does the order apply to individuals or groups? To human society alone or animals, plants, and planetary systems? If understanding is found in the balance between two contradictions, in which scale do we place our heart, and what will we measure it against? Budge, E. A. Wallis, Ed. The Book of the Dead: The Hieroglyphic Transcript and Translation into English of the Papyrus of Ani. New York: Gramercy Books, 1960. Donleavy, Pamela and Ann Shearer. From Myth to Modern Healing: Themis: Goddess of Heart-Soul, Justice, and Reconciliation. New York: Routledge, 2008. Hall, Manly P. The Secret Teachings of All the Ages. New York: Penguin, (1928) 2003. Karenga, Maulana. Maat: The Moral Ideal in Ancient Egypt. University of Sankore Press, 2006. Kennedy, Randy. “The Lady With the Scales Poses For Her Portraits.” The New York Times. Dec. 15, 2010. Accessed October 1, 2015 at http://www.nytimes.com/2010/12/16/books/16justice.html?_r=0.